holtge, Doug Wallen, Bert Greene and 4 others like this. Find the new line of Gunsmoke during season 11. Matt Dillon’s handgun and Matt Dillon faces a gunslinger. Matt Dillon’s face and the first use of the series logo. The second use of the series logo. The first credits for James Arness. Matt Dillon’s handgun used a background for the producer credits. Matt Dillon’s hanged hat used a background for the third use of the series logo. Matt Dillon’s hanged hat used a background for the second credits of James Arness. Matt Dillon’s office winchesters used a background for the associate producer credits. Matt Dillon’s office winchesters used a background for the cinematographer credits. Jack K, Tony Bensley, Flashgear and 3 others like this. And why season 11? It's the final season of the series to be telecast in monochrome. bmasters9, Flashgear, JohnHopper and 1 other person like this. Nice introduction to season 11, John! Look forward to your episode reviews. Flashgear and JohnHopper like this. It makes a good transition from Rawhide to Gunsmoke: both produced during the 1965-1966 interval. Another marvelous example of CBS' remastering-- looks splendid on DVD! Doug Wallen, JohnHopper, Flashgear and 1 other person like this. I just remember how in the 1980s, finding episodes of the black and white hours was a big deal. There were 2 syndication packages, the 6 seasons of half hours and the color hours, and the black and white hours were not available. 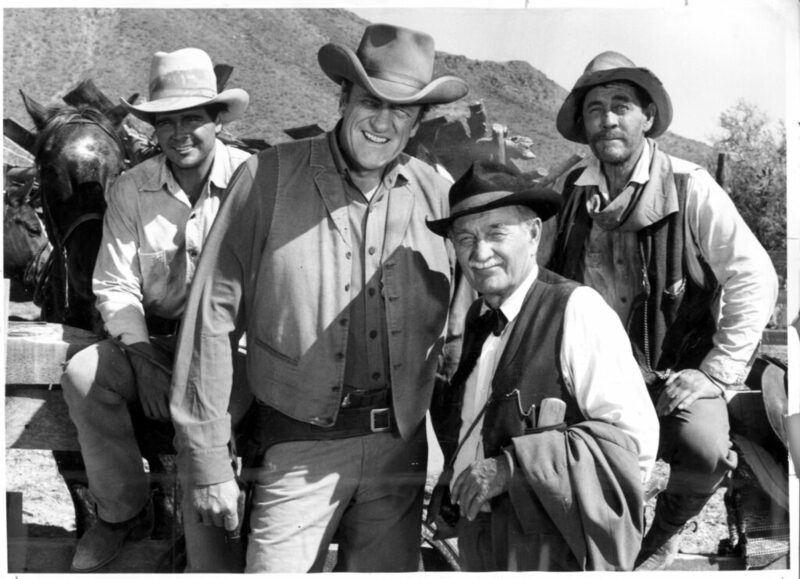 I believe that Encore Westerns was the first time they had aired since their original CBS run. Ron1973, Doug Wallen, Jack K and 2 others like this. Actually, when CBN had its Saturday afternoon western line-up, they did run the hour-long b&w "Gunsmoke" in 1986-87. But I don't think they got too far along into them, airing one episode per week. It might have just been the 1961-63 seasons that got shown. I'm not sure. I taped a few of them, back then. Prints were decent, but looked a bit 16mm-ish as I recall. Not as good as the Encore Westerns prints. The CBN run was selected episodes from each of the b/w one-hour seasons. The did use 16mm prints, but the shows were cut to about 46:30. Jeff Flugel and Bert Greene like this. Tony Bensley, Jeff Flugel and bmasters9 like this. Those cards are more vintage television history right there, especially being remastered and looking as sharp as they are! Jeff Flugel and ClassicTVMan1981X like this. The same cards appear in the first and monochrome season of The Wild Wild West. Season 1 of Gomer Pyle, U.S.M.C. Tony Bensley and Jeff Flugel like this. “Don’t touch those guns, Marshal. If you do, I’m gonna have to open up the other world for you”. During a whole night, Dodge City is taken over by an army of robbers dressed as cow punchers and acting as putschists led by Mace Gore (actor John Drew Barrymore) who isolates and blocks the town and confiscates all guns. They order the population to give them their valuables: silver, money, jewelry, wedding rings. The headquarters of the robbers is at the Long Branch—the saloon of Miss Kitty—where they count the loot and store the weapons. But the robbers let their impulses loose like mad dogs and abuse people and in the course of the actions, they even gun down Marshal Dillon! In order to keep the gang in Dodge for the army to pick them up, Festus creates a phony story of a gold shipment coming from the train. It’s a strong season opener and a tough military coup-like episode in which murdering outlaws rob the population of Dodge City: a must-watch that is served by the low-key cinematography. The dark music score by Morton Stevens reinforces the martial nature of the criminals’ MO. The cast of bandit characters (Michael Vandever as Raider, Al Lettieri as Smitty, Morgan Woodward as Deeks, Jerry Douglas as Clark, Johnny Sevens as Barens) is really good and especially, John Drew Barrymore as leader Mace Gore. Miss Kitty fails to be raped by bandit Barens and Matt Dillon fails to be beaten up by a bunch of dark alley rapers. After the shooting of Matt Dillon, the townspeople are frozen as statues in the middle of the street. Both writer Clyde Ware and director Vincent McEveety work on Rawhide during its season 7. Actor John Drew Barrymore returns from the season 10 “One Killer on Ice” and also work on Rawhide during season 1 (“Incident of the Haunted Hills”), season 7 (“Corporal Dasovik”) and season 8 (“Ride a Crooked Mile”) and on the first season (“The Night of the Double-Edged Knife”) of The Wild Wild West. Actor Morgan Woodward returns from the season 3 “Potato Road”, Johnny Seven from the season 7 “Nina’s Revenge”, Allen Jaffe from the season 10 “Winner Take All”. Actor Al Lettieri appears in one season 7 episode (“The Meeting”) of Rawhide dealing with gangsters. Absolutely recommended! For the friends of Sam Peckinpah’s films! Mace Gore and his two henchmen threaten Matt Dillon. Mace Gore and his two henchmen inside the marshal’s office. Mace Gore and his two henchmen fire to warn his men and to corner Matt Dillon. End credits for CBS composer Morton Stevens. Jeff Flugel, bmasters9, Flashgear and 1 other person like this. End credits for CBS composer Leon Klatzkin. Thanks for introducing me to a new word, John - putschist. Had to look that one up...That first episode reviewed above sounds like a good one. “Seven Hours to Dawn” is the first of the two masterpieces of season 11. It's a must-watch. bmasters9 and Jeff Flugel like this. Four wild drovers led by Sam Band (actor Jack Elam) terrorize owner of a general store John Greenwood (actor Paul Fix) working as a sheriff and his son Thaddeus (actor Roger Ewing) working as a deputy for a very small town in Oklahoma that Sam Band humiliates and calls “plowboy”. Thad goes after the four drovers and meets Matt Dillon and Festus. His father has a stroke and dies. Thad heads to The Long Branch at Dodge City, Kansas. Unable to pick them up in that state, he keeps on watching them in a silent way as an ironic harbinger of death and wait for … The drovers are crooked and simulate a wolf threat issue thanks to three German shepherds. It’s a nice revengist drama and a good introduction to the character of Thad who is eventually hired by Matt Dillon but the sherry on top is the performance of actor Jack Elam as the nasty heavy. The four drovers are played by Jack Elam, Sherwood Price, Robert Sorrells, Allen Jeffe. Don’t miss the fight scene between Thad and the drovers at Delmonico’s accompanied by Richard Shores’ vivid music. Two bartenders play music at the Long Branch: Sam at the fiddle and Rudy at the guitar. After Morton Stevens, this is the second composer working on The Wild Wild West but also lets two scores on Rawhide. For the record, Shores will write music during the four seasons of The Wild Wild West. Actor Jack Elam is a recurring guest on Gunsmoke and returns from the season 10 “Help Me, Kitty” and appears on both Rawhide and The Wild Wild West (see the season 3 “The Night of Montezuma’s Hordes”). Actor Roger Ewing returns from the season 10 “Song for Dying” as a different character, Allen Jeffe from this season “Seven Hours to Dawn”, Paul Fix from the season 9 “The Other Half”, Robert Sorrells from the season 10 “Breckinridge”. End credits for CBS composer Richard Shores. Out of the blue, Matt Dillon faces individually five gunslingers (Miguel Samando, Billy Coe, Doyle Phleger, Al Tresh, Jack Pinto) who try to kill him for $25,000, including an old friend and a retired sheriff. But things are not what they appear to be … It’s a frame to eliminate five guilty men out of ten conceived by a ruined and revengist rancher named Ben Pringle (actor John Marley). It’s a good gunfighters episode thanks to director Mark Rydell and a singular twisted rework of Agatha Christie’s novel Ten Little Indians adapted to the series mold—two years later, the plot was redone in the episode “The Superlative Seven” from the British espionage series The Avengers. The ensemble of actors’ performances are very good: the picturesque professional hired guns (Bruce Dern as Doyle Phleger, Warren Oates as Al Tresh), the rancher acting as a sneaky observer (John Marley as Ben Pringle) and the two-faced former sheriff (Nehemiah Persoff as Jack Pinto). The sherry on top is to witness Festus and Al Tresh having fun at the Long Branch! The cue that highlights the final showdown is written like “King Nine Will Not Return” from The Twilight Zone. After Morton Stevens and Richard Shores, find the third composer working on The Wild Wild West (see the season 3 “The Night of the Undead”) but also participated at Rawhide. This is the first part of both actors Nehemiah Persoff and Bruce Dern on Gunsmoke and Persoff guests in both Rawhide and The Wild Wild West. Actor Warren Oates is a recurring guest on the show and returns from the season 10 “Circus Trick”. End credits for CBS composer Fred Steiner.